A video made by IK5FKA, Roberto Del Bianco, covering the YOTA Openday. This was the last get-together of the Youngsters On The Air event in Marina Di Massa, Italy during which every team could express their feelings about the past week! I am sorry to inform you that this is the last time you will be reading Dante’s scribbles about YOTA 2015 (I bet some of you are saying: “Thanks God”). The time has come to say goodbye to our weird guys, our monsters, witches and princesses. The time has come to put the final dot on this event called YOTA Italy 2015. Dante is very unhappy because he has to write the final blog. But he can’t do anything about that. He would like to stay forever on YOTA, and he is sure many people would do the same. Saturday, 25th of July. Morning. No persons sleeping. There was no time for that, as Dante said in the Thursday blog, take a nap when you get home. Or number was smaller than on Friday. Christos 5B4AIP, Kati OH2FKX and Nicole IZ3XAK had to leave that day. All of us were sad, some even released a few tears from their eyes. Well, the breakfast was at 8 as usually (but no pasta ). And as usually, many people were not there. As one of our Irish friends has said it: “We could use some search parties”. The previous night was a relief to us, we had some rain, and even we had some thunderstorm. It was a bit noisy but we didn’t pay attention. Some of us were “Chilling like a boss” (our friend Suzan from PA). Never minding of QAZ, our guys at the station were working round the clock. It was a night for CW, after all we had so few QSOs in telegraphy and a way more in phone. Despite of everything, we must write about the most hated part of every gathering: saying goodbye and leaving. After breakfast, two teams had to say goodbye. 9A an YU left by their cars. Following them, our organizers started transporting them to Pisa. Very large teams from E7 and ZS left at around 9. They had a spot of luck, just like the ON team that left 1 hour before breakfast, because everything was running smoothly for them. Later in the day we had some serious weather change. To say it shortly, it reminded many of the Biblical Flooding. Very heavy rain caused all of the flights from Galileo Galilei airport to be grounded. Just like a British weather, wouldn’t you say? Luckily the rain didn’t last so long, and youngsters were on their way back home. Some were travelling by the train, some were travelling by bus, some by car, etc. Everyone got home safely, everyone had an interesting trip with many anecdotes. Some of us had problems with their car, some had an argue with crazy bus drivers, some were mentioning embarrassing photos, some were mentioning waitresses. We’ve already mentioned our friends who were travelling by plane and troubles they had. I would have said more about some other teams but didn’t get the info. I’ll have to ask you for an apology. What to say at the end of the article? Well, it was a great week. For me personally, the best week in my life, and I am sure there will be some more persons that will agree with this statement. 7 days of enjoyment with fellow amateur radio operators, 7 days of lectures (not about coaxial cables, about friendship), 7 days to act silly, 7 days to make noise on the bands, 7 days to learn something new, 7 days to make new friends. 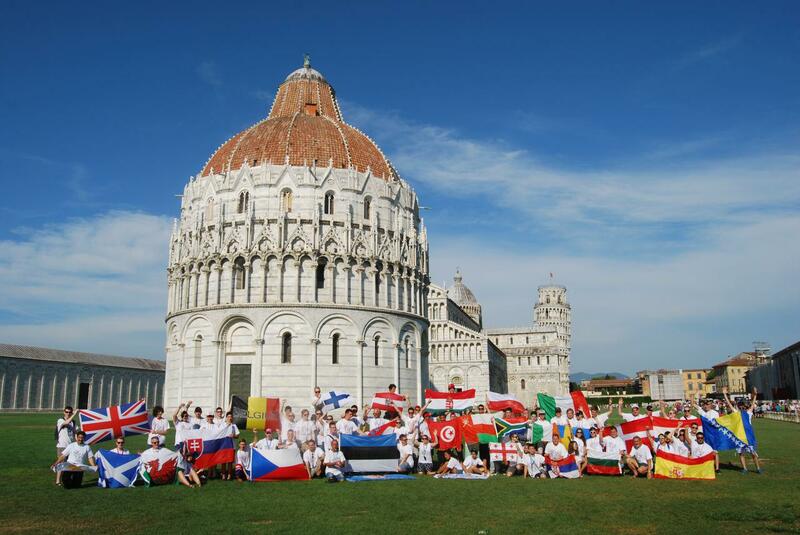 YOTA Italy has made itself a place in the heart of every participant. We may be thousands of kilometers away, and yet there will be a part of our personality somewhere out there under the hot Sun and blue sky of Tuscany. And for the end, I’ll say a sentence that has been repeated by all of the youngsters on Saturday: See you at YOTA 2016! Sea. Beach. People hanging out and just enjoying the evening. Nothing special about that. Or is there? It’s the twenty fifth of July and, essentially, the last day of the YOTA week. It started out pretty much like every other day – breakfast, energizer that was initiated by the SM team. But one could still feel that the end of an amazing week is rippling on the horizon by the sight of sullen faces and thinning audience at the D4C presentation (lead by Fabio). 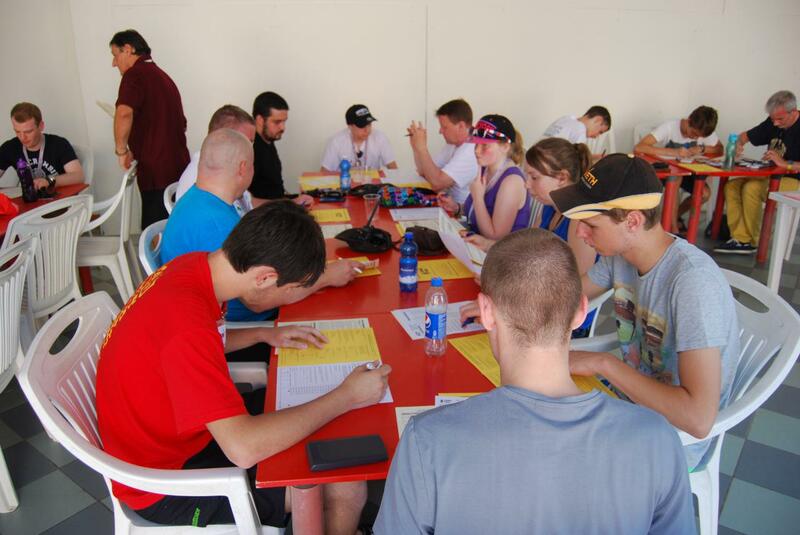 After Fabio’s detailed and quite impressive introduction to the station in Capo Verde and the activities that take place there, the teams that hadn’t still taken off had to prepare a two-three minute speech for the YOTA Open Day. The concept was clear – vocalize your impression of the week on behalf of the team you belong to. Except how do you express the feelings of gratitude, satisfaction, of joy and yet – a tinge of bitterness that all is coming to an end? We came to the conclusion it wasn’t an easy task, probably even harder than CW is for absolute beginners. But we accepted the challenge anyway. We used our free time to cool down, take a breath and really think about what YOTA 2015 meant to us. As a result followed a tear-inducing get-together. It started with a presentation again, this time by Silvio, a computerized goodbye, to say so. And then there was the youngsters’ turn to speak. Although representing different countries and cultures, the feelings we shared were similar. The words came hard not because they were insincere, but because they came from the heart. We laughed together at the splendid sketch the boys from the OK team played out, which involved a comic view of the past couple of days (and a lot of pasta, pun intended). Then some more emotional words were said, to wrap up the program, and we were free to go to dinner and prepare for the farewell party at the beach. The fifth edition of Youngsters On The Air is almost at its end and it passed with the velocity of the light. We learned together, laughed together, sang together, but most importantly, we had the same meal together for seven days, and if something like that doesn’t bring strangers and friends alike closer together, then I really don’t know what does. This year, once again, we managed to prove that HAM Radio means family and that radio, whereas it is often perceived as dead or dying, is very much alive and in the hands of very talented, dedicated young people. And, above all, isn’t that what YOTA is about? Sea, beach and people hanging out. A familiar scenario, yet precious to those who are a part of it. Tomorrow will be home, or traveling to get there, but the memory of our week together will linger about long after. And the friendships we begun? Oh, these will remain forever. Here comes Dante, back on the air! What we have on the menu is Thursday at Marina di Massa. A day like all others. Well at some point yes, and at some point different because we all felt that the day to say goodbye is closing in. As usual, breakfast at 8:00. Not all people were present, some of our friends were still enjoying the hug of their bed, they stayed a bit longer the previous night. As they have said: “There is no time for sleeping at YOTA, take a nap when you get home”. We got ourselves energized by OH team. Interesting game, but some were snoring a bit after the game (maybe our friend Ger from EI, not sure). Later our traditional, and in opinion of many youngsters, the most favorite activity, “Good Morsing” led by our friend Jurek SP3SLU. On this Good Morsing, we had a little presentation of CW software by Goran YT7AW, our high-speed man. He showed us that old fashioned Morse code can be used in some interesting ways. Later on, we followed the same routine, presentations, beach, swimming pool, presentations, beach, swimming pool, and so on. We have learned what a Yagi antenna (one of the most frequent words in the radio business) is, we also learned a few things about the possibilities with an SDR- Software Defined Radio. 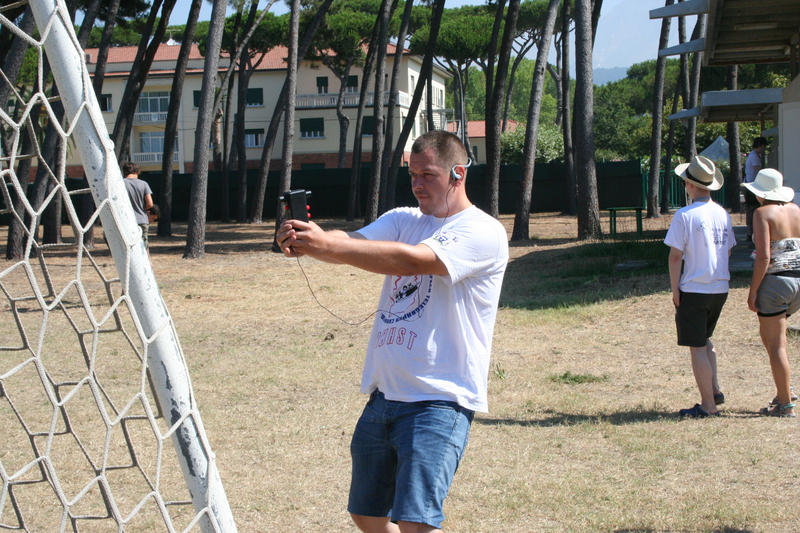 One of the highlights of the day was the off-air contest, by Kris ES7GM (P33W in the contests held at the camp). Very interesting and dynamic thing, just as exciting as the real deal. Huge pile-ups on our 20, 40, and 80 meter benches. Some handled it like professionals, while some others were feeling a bit uncomfortable, they were nostalgic for that beautiful noise of the radio receivers. (We were not so nostalgic about QRM, we had enough of it even off air thanks to our QRM-makers ON3YH and ON2TD). ON2TD playing some SSTV signals through a speaker as ‘QRM’. In the night, we had a lottery, where the main prize was the little beauty, a paddle for telegraphy called Begali Simplex, donated by Mr Piero Begali I2RTF, legend of key-making business. He also donated another key, Begali Signature, to be used as official key of the YOTA program. The lucky winner of Begali Simplex was Tauri ES5HTA, while the Signature key was given for one-year period to the camp mascot Duško, E77CW. (Both of the guys were happy. YOTA participants, guess which one was more thrilled). Quite a busy day indeed. In the night, we continued the party on the beach. Yeah! We enjoyed it very much. Some preferred they chairs while other were on their feet trying to make it fun to the others (burying in the sand for example). Mr. Murphy had to put his fingers in, he had to spoil the fun. We had to say goodbye to our Estonian friends, since they had to leave tomorrow morning. It’s needless to say how sad we were. Thank you Eerik, Kris and Tauri for a lovely time. That would be it about our Thursday. Thank you for reading this humble blog. 73 de Dante on the Air. This day started earlier because we were going on a trip to visit Florence and Pisa. The weather report predicted incredible 38°C there, so everyone followed Silvio‘s suggestion to bring lots and lots of water. After a short breakfast we got on a nice, air-conditioned bus which carried us across the beautiful landscape of Tuscany. When we arrived in Florence, we were blown away by the heat although it was only morning. 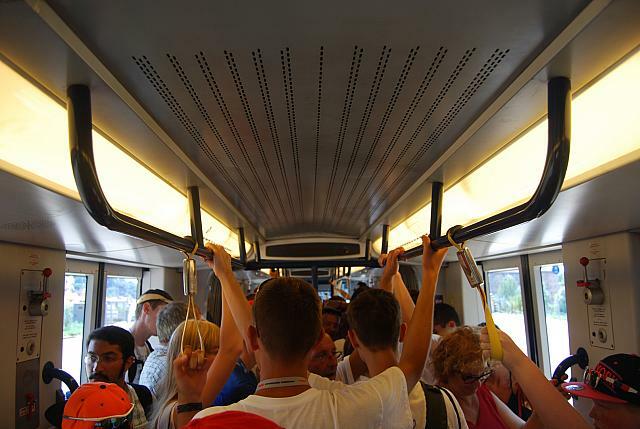 Luckily the tram we took to the city center was comfortable and cool as well. We were divided in two groups so that it would be easier to keep together when exploring the city with our two tour guides. They showed the famous old buildings of the city, which existed for 500 years and even longer. It was interesting to hear the history of how the city became so rich and why the Reinessance started from here. 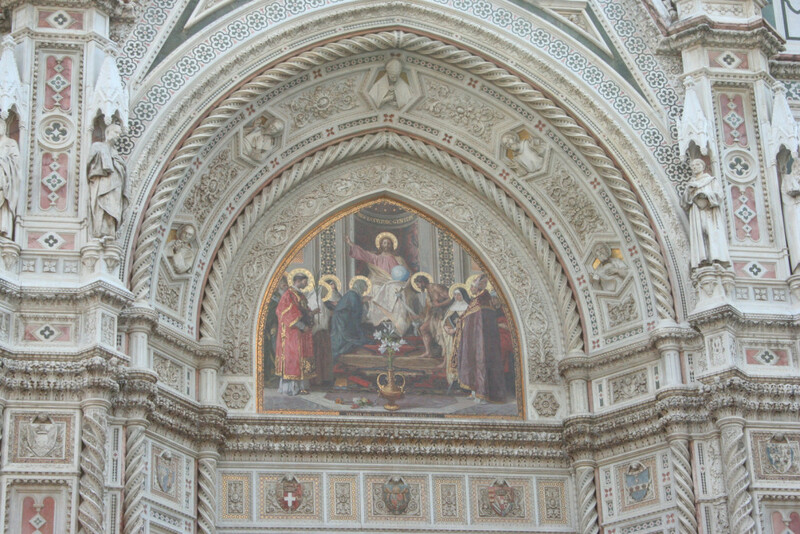 We visited the famous Santa Maria del Fiore cathedral and were really impressed by the size, the beautiful exterior and the huge dome and bell tower. The inside was suprisingly modest, but still somehow beautiful. And certainly huge! Afterwards we stopped at Michelangelos famous David-Statue – or at least the replica in front of Palazzo Vecchio, the town hall of Florence. Keeping the groups together and always checking if no one got lost required a lot of „screaming“, Alex was alreay a bit short of voice and Silvio was happy if the Japanese tour guide borrowed him her microphone and portable loudspeaker. At half past one, after we were fairly tired from two hours walking through the hot city, we had freetime for lunch. After lunch we got on the bus to Pisa, the second part of today‘s trip. 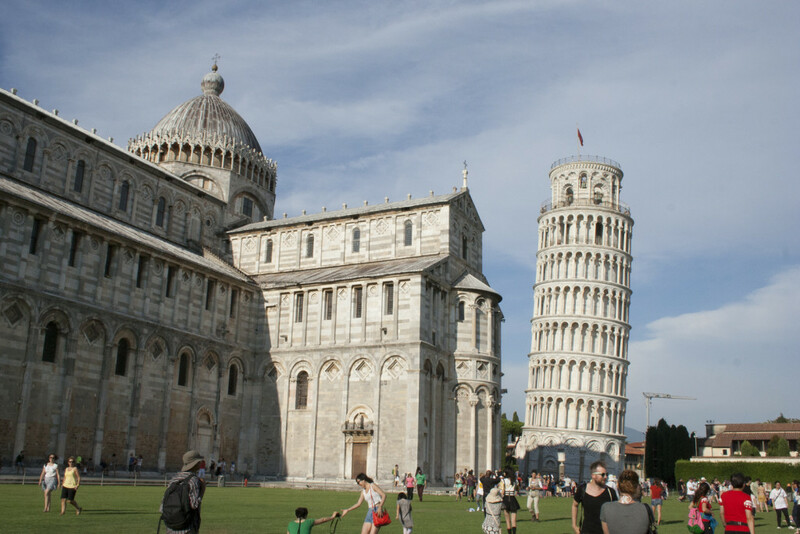 We walked to the famous leaning tower of Pisa to take a nice photo with the big group – or better: to take probably a thousand photos waving our national flags in front of the famous sight. Some tourists might have wonderd why a huge group with many different national flags were shouting „dah-di-dah-dit dah-dah-di-dah …“ For sure we know … It was so loud that even a policeman came to see if everything was right. In the bus back to the hotel we got another nice view of the mountains. The trip made us hungry and tired, so we were looking forward to dinner and watching the sunset while relaxing on the beach! All pictures from today can be found here! Hello to all readers! The “Dante On The Air” team is back after a little break. The things at YOTA camp are going on perfectly. Our Tuesday started with some energizer led by our friends from EA. After getting energized (some were still sleeping I guess), youngsters went on to the shack for some Good Moooooooorsing activity by Jurek SP3SLU, where they were introduced to the beauties of the world called “Telegraphy”. Following the Good Morsing, we divided into two groups. 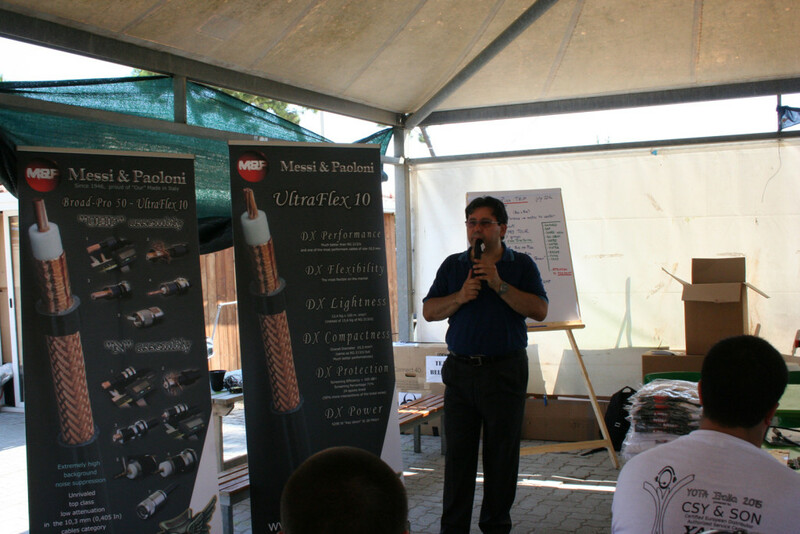 One group had the presentation of ARDF by LZ1US Panayot and his youngsters Neli, Gergana LZ1ZYL and Stanimir. Since the ARDF was new to many youngsters, they enjoyed looking for some strange low and high sounds that are very similar to the good old Morse (I personally enjoyed my first time on ARDF). Our official day included another presentation, a technical one, about one of the most important parts of a good station: the coax cables. 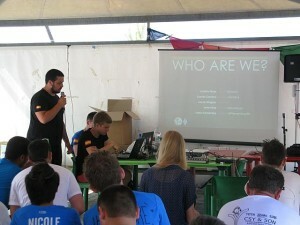 Our presenter was one of the owners of the company called Messi & Paoloni, Mr Messi (Not the footballer Lionel) Stefano. OK, he may not be the football superstar, but he is equally popular in amateur radio world as the other one in the world of sport. After ending the presentations part, we went to have some fun. Some had fun on the bands like 20m and 40m, while others had fun on the bands like the beach or the swimming pool. And in the night time, the most interesting part of the day: The treasure hunt, organized by PA team. Oh boy, that was a dynamic one. We were searching the grounds of the Torre Marina for little orange balloons just like the detectives in the novels. Some were more successful, some less. At the end the winner team was awarded with some biscuits. A small drone video showing part of the YOTA Italy camp site. Thank you to Leonardo Bartalucci IW5EFX for this amazing video. In the video you see the tents that we have our presentations in. Followed by an overview of the pool and the ocean we have access to. You can also see the antenna and the Italy, YOTA and YOTA Italy flag. As almost every day of the YOTA-week, the morning started with an energizer to help us wake up (especially after the Intercultural evening which, for some of us, lasted till the early hours). Todays energizer was organized by Team G.
After waking up we got our first lesson of “Good Morsing” by Jerzy SP3SLU. We got to know the “CQ Serenade” song. 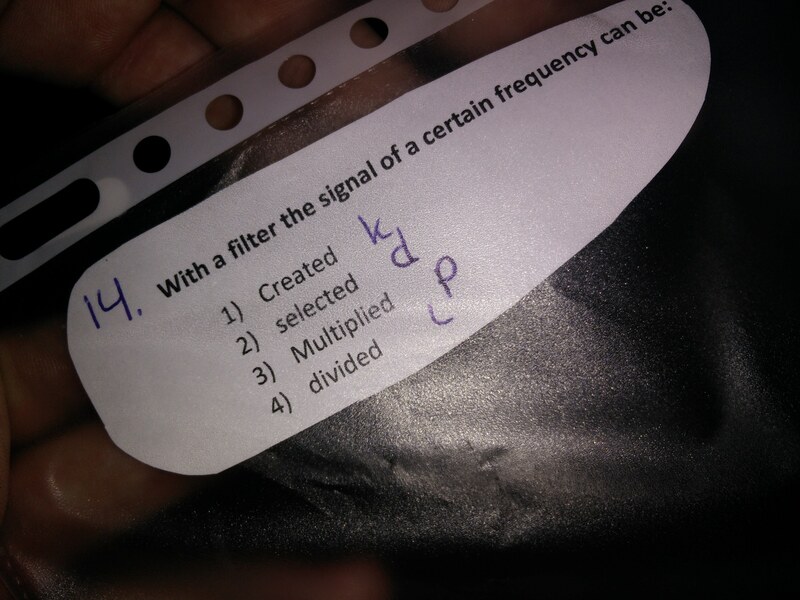 We learned how to “spell” CQ and YOTA in CW along with some other abbreviations. After the “Good Morsing” lesson, it was time for some ARDF. We got divided into two groups, one who would do ARDF today and one who would do it tomorrow. 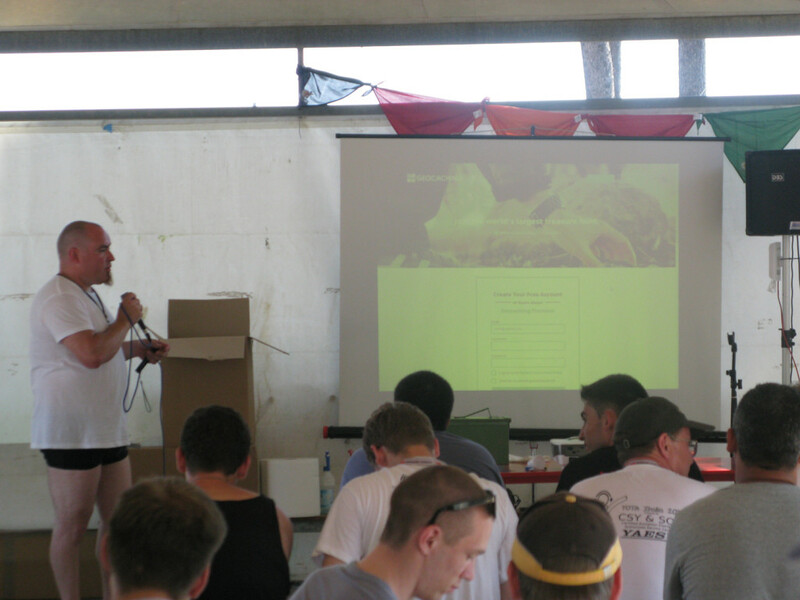 After the ARDF, Florian OE3FTA gave a small presentation about DXing, contesting and the DO’s and DON’Ts. The group that wasn’t participating in the ARDF did some beachgames or played the Kubb game. 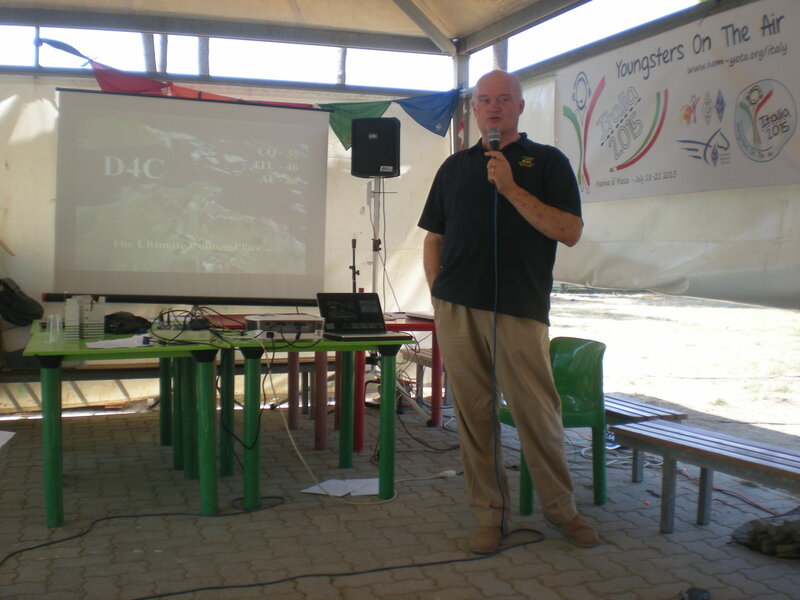 As last, just before lunch, we got a presentation about the Italian ARISS (Amateur Radio on the ISS) program by IK5EHI. A lot of youngsters were interested, some of them got a new waypoint in Amateur Radio! After lunch, the “Golf Team” showed us how to build a HF wire antenna to be used at the camp. Afterwards, Tommy ON2TD gave a presentation about Geocaching. You can see it as a worldwide ARDF game. Small “logbooks” are hidden in little boxes all over the world (over two million by now). You can go search them and log them yourself. Finding the caches can be done with the help of a GPS or just a normal smartphone. We closed the evening with a dive in the sea. 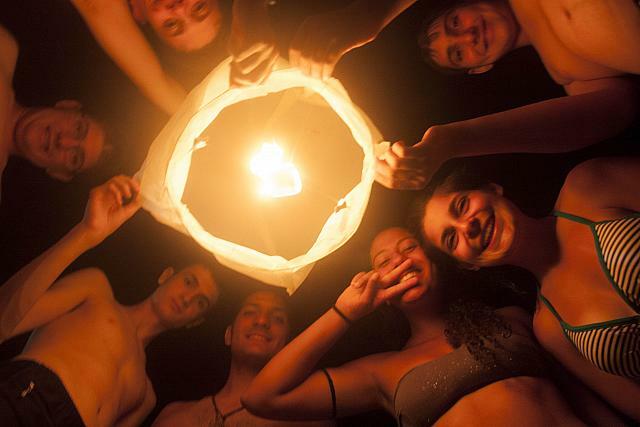 It was fresh, unlike the tempratures around here… After our swim, Silvio IZ5DIY and Alex IV3KKW suprised us with a box full of Chinese lanterns. We had an amazing evening, got to know many new friends and had a good laugh together when some of the lamps took a dive into the sea. There were even some competitions between teams to modify the lanterns to go as far as possible.